Shut main water supply off and winterize any equipment (ie. Pump, pressure tank, softeners, etc.) as you would normally. Shut power supply or fuel source off to Hot Water Tank before draining, and likewise keep power or fuel off until tank is filled in spring. 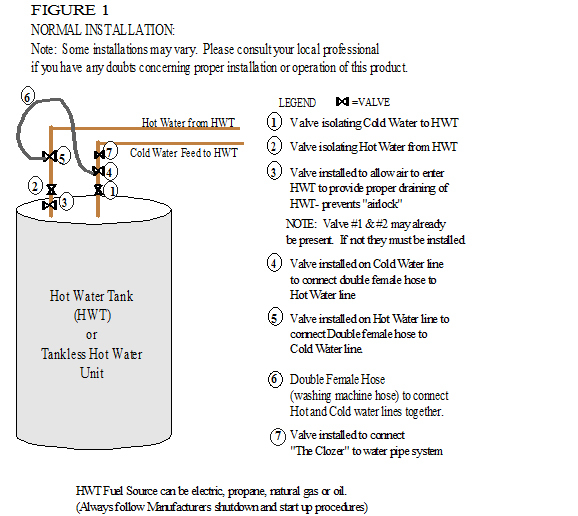 NEVER HAVE POWER TO YOUR HOT WATER TANK IF EMPTY. Connect a hose to the drain valve on the Hot Water Tank and open drain, draining to a safe location, open valve #3 to allow air into Hot Water Tank to prevent air lock. Remove lid on “The Clozer” and fill plumbing antifreeze reservoir with non-toxic plumbing antifreeze. IMPORTANT: Always check the level of plumbing antifreeze in “The Clozer” reservoir during this winterizing procedure and add accordingly to keep it topped up. Connect power connection on right side of “The Clozer” to 115V outlet with extension cord plugged into wall receptacle. “The Clozer” pump will automatically start and run until approximately 60 psi is obtained. Open valves #4 & #5 that the jumper hose is connected to (see Figure 1below) allows Hot & Cold water lines to be tied together allowing antifreeze into both simultaneously. “The Clozer” pump should re-start and run until 60 psi is obtained and shut off - pressurizing your system. Repeat Step 11 at every faucet, bathtub, and shower (anywhere you draw water from) throughout thebuilding and outside taps as well. NOTE: some low flush toilets retain a substantial amount of water after flushing and this may need to be bailed out or sponged out of tank so as not to dilute the plumbing antifreeze. If you have a dishwasher be sure to start dishwasher on shortest wash cycle and allow it to complete this cycle, allowingthe water supply line, solenoid and also the discharge pump to be filled with plumbing antifreeze. Proceed to clothes washing machine and set dial to COLD water only, turn machine on until solid pink is observed in washing machine drum and shut off washing machine. Repeat this by setting dial to HOT water only, turn machine on until sold pink is entering drum and shut off washing machine. Repeat again by setting dial to Hot/Cold WARM setting and turn on machine allowing approximately one litre of plumbing antifreeze to enter the drum. Advance to pump out cycle to winterize washing machine pump. NOTE: Refrigerators with Ice & Water dispensers – Refer to owner’s manual. Waterlines servicing this equipment may be winterized by simply drawing water or allowing equipment to call for ice maker to start, until solid pink is observed. NOTE: “The Clozer” puts antifreeze into every water outlet and drain that you physically draw water from during this winterizing procedure. Make sure that you have protected every water outlet & drain within your building. NOTE: All main water supplies (ie. Pumps, pressure tanks, etc. )and any specialty filtration or water treatment equipment should be winterized as you would normally, following themanufacturer’s instructions.